An in-house project of emPhys Physical Technology. The geometry model comprises the 1 m parabolic dish and the patch feed. Due to the high power requirement the patch cannot be realized as a PCB or ceramic patch. A low loss design with air dielectric is required. The model avoids reflections at the outer boundary by surrounding it with a perfectly matched absorption layer. 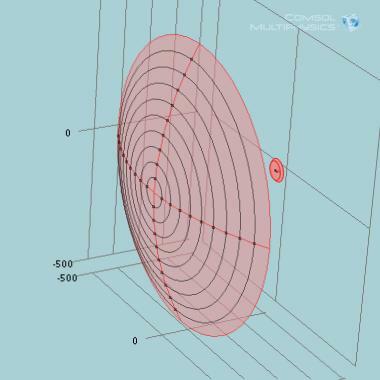 Assessment of radiation pattern by 3D-visualization and polar diagram in H and V plane. The main lobe achieves a directivity (gain) of 24 dBi. This results in illumination efficiency of 50 %. S11 and reactances of the patch feed in the frequency range 2.1 to 2.5 GHz. Coaxial feeder and focal position of the patch feed are optimized. Please find the details below. 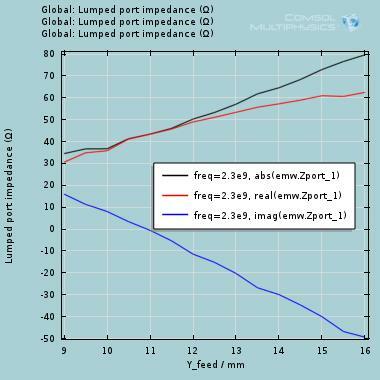 Below we show the impact of the patch feed's focal position to the impedance match at the nominal frequency of 2.3 GHz. The patch was shifted by ±50 mm from its theoretical focal position. The left diagram shows S11, the right shows the reactances. 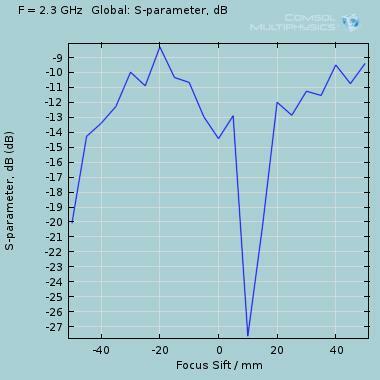 These datasets are available for the frequency range 2.1 to 2.5 Ghz. The study parameter is here the distance of the connection of the coaxial feed on the patch radiator disc and the disc's center. 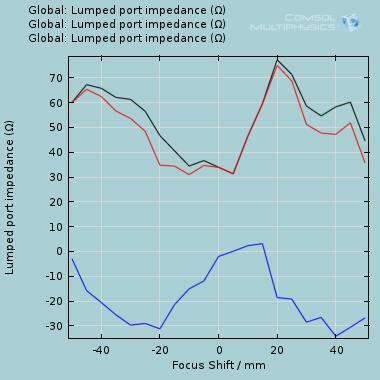 A center distance of 11.0 - 11.5 mm results in an excellent impedance match to the 50 Ω system impedance. The diagrams below show the parameter results at 2.3 GHz. These datasets are available from 2.1 to 2.5 GHz. We made a prototype according to the results of the model and characterized it . 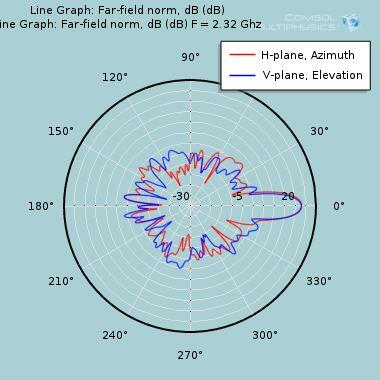 We show the measured and calculated S11 diagrams for comparison in the spectral range 2.2 - 2.5 GHz. The left diagram show the S11 curve as measured with a Rohde & Schwarz ZVL3 network analyzer, the right diagram shows the COMSOL result. For the measurement the patch feed was not mounted on the dish but radiated into the laboratory. 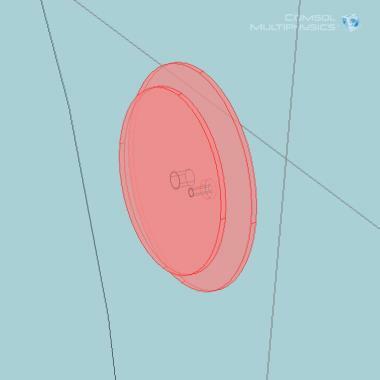 Also for the calculation in COMSOL the dish was removed from the model. 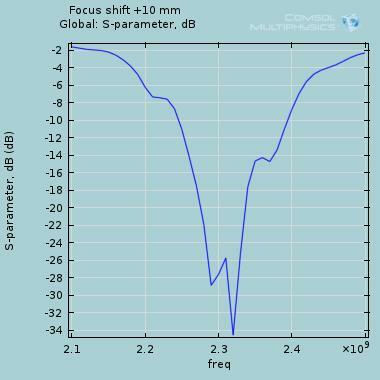 Measurement and model show excellent agreement in resonance frequency with a realistic S11 = - 15 dB. 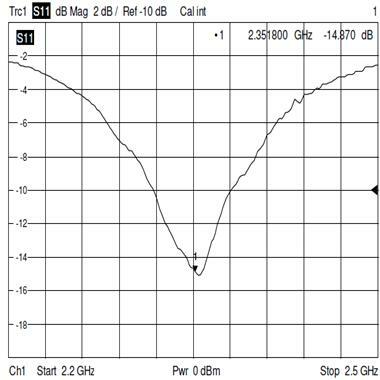 The model value S11 = -27 dB seems to be 'too good to be true'. This is probably due to the idealized conditions of the model. The model's perfectly matched layer (PML) avoids reflections very well. The measurement were carried out in normal, not reflection-free chamber. 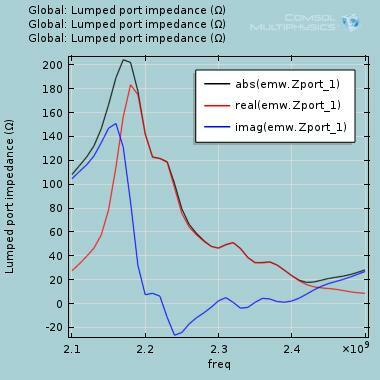 Furthermore the model avoids error sources like cables, connectors and calibration error of the analyzer. 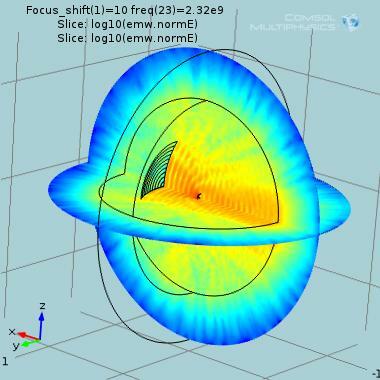 A model for the optimization of a patch feed for a small parabolic dish antenna was developed with COMSOL Multiphysics. 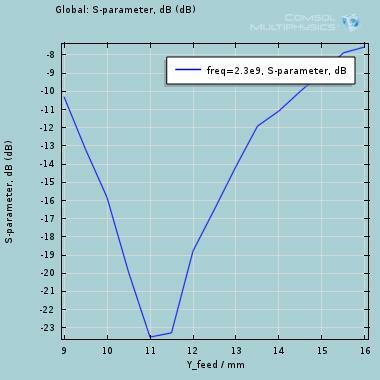 The model ids fully parameterized regarding all geometrical dimensions of the antenna. The patch feed could be specified regarding frequency, impedance match, focal position and dish illumination. The illumination efficiency of now 50 % may still be improved to some degree. The study is going on. 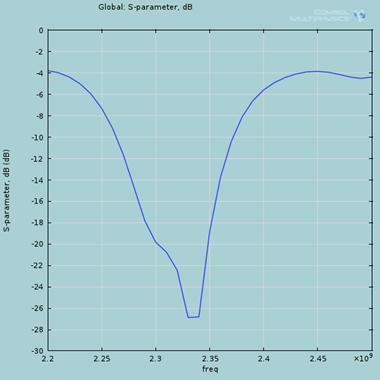 We will be trying to improve the bandwidth and we will introduce circular polarization into the model. We will investigate two strategies to achieve circular polarization and we will report about results here. This model takes some 15 minutes for one parameter set on a 4 core i7 CPU at 3.6 GHz. It needs about 40 GBytes memory with direct solver. A comparably comprehensive prototype study would require manufacturing many prototype variants and a plentitude of measurements in a reflection free chamber. 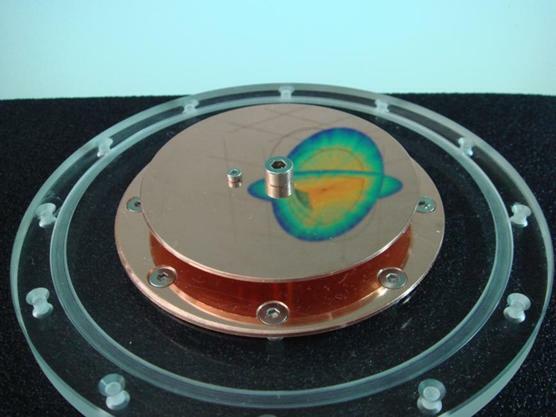 We plan to bring this patch antenna to the market in linear and circular polarized versions. As the model is parameterized it can easily be adapted to other operation frequencies. The rage from L band at 1.2 GHz up to Ku band at 12 GHz seems realistic. Please contact us if you are interested in this development!